Two items of news extremely positive for the supporters of Tradition have come in from England: the Fraternity of St Peter have been given a church in the Archdiocese of Liverpool, only a short time after the Institute of Christ the King had been given the second of two churches in neighbouring dioceses; and the Bishop of Portsmouth has established a bi-ritual parish in Gosport, a town on the South coast near Portsmouth itself, where Fr Serafino Lanzetta will be Parish Priest. The website of St Mary's, Warrington, a fine Pugin church in the centre of the city, has this message from Archbishop Malcolm McMahon of Liverpool. Conference in Ratcliffe College, Leicester. 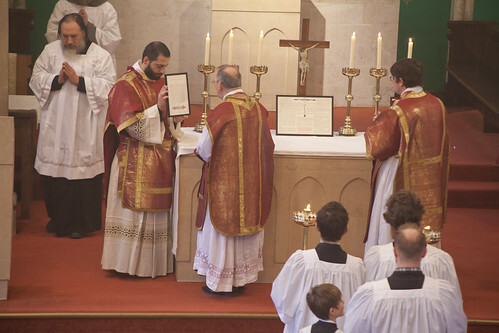 This brings the number of dioceses in England who have welcomed one or other of the Traditional Institutes to five. They are Portsmouth (where the FSSP have a canonically erected house of residence, in Reading); Northampton (where the FSSP has an official 'Chaplaincy' established by Bishop Doyle); Liverpool (where the FSSP will now have St Mary's Warrington); Shrewsbury (where the Institute of Christ the King are the custodians of the Shrine Church of SS Peter and Paul in New Brighton in the Wirral), and Lancaster (where Bishop Campbell last year gave the Institute of Christ the King the magnificent church of St Walburge's, Preston). The clustering of traditional places of worship in the North of England is not a coincidence: England's northern dioceses have a long-standing liberal reputation and are extremely short of clergy. They were served by by the notoriously 'progressive' Ushaw seminary until it closed, for lack of students, in 2010. 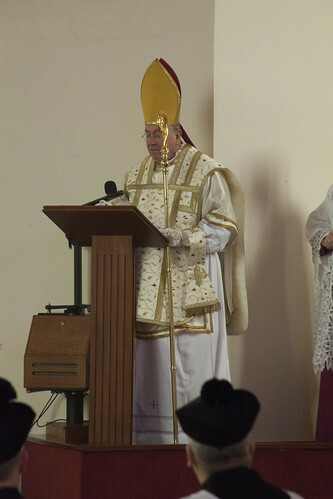 Manchester (diocese of Salford) and York (diocese of Middlesbrough) have both recently established Oratories of St Philip Neri, in both of which the Traditional Mass is offered every Sunday. In each of case the future of a fine historic church has been assured, along with the pastoral care of the people and the hope of future vocations. Fr Lanzetta is the author of an important work, so far available only in Italian: 'The Second Vatican Council: A Pastoral Council'. Our Lady of Caversham; he was subdeacon.